Showing 7 articles from September 21, 2018. LOUISBURG--Funeral services for Bernice "Pinky" Long Alston, 63, who died Wednesday, Sept. 19, 2018, will be held Sunday, Sept. 23, at 2 p.m. in the Richardson Funeral Home Chapel in Louisburg, with Bishop Carl Wardrett officiating. Burial will follow in the Haywood Church cemetery. FRANKLINTON--Jeremy Ryan Hardy, 38, died Saturday, Sept. 15, 2018. A memorial service will be held Thursday, Sept. 27, at 7 p.m. at Franklinton Baptist Church, 102 W. Mason St., Franklinton, with the Rev. David Averette officiating. The family will receive friends following the service. HENDERSON--Ruby Mae Pike Shorkey, 100, of Henderson passed away peacefully surrounded by family on Thursday, September 20, 2018. She was born on October 6, 1917 to the late James and Edith Heath Pike. Ruby always saw the beauty in everything around her. She loved to play the piano and cook for her family; her specialties being beef stew and cookies. Her children had the privilege of being "raised right" by a true southern Christian lady. She was the oldest living member of Perry's Chapel Baptist Church where she loved to sing. FRANKLINTON­--Sue Knox Truitt, 72, died Sunday, Sept. 16, 2018. A funeral service will be held at 3 p.m. Sunday, Sept. 23, in the Chapel of Bright Funeral Home, with the Rev. David Averette officiating. Entombment will follow in Pine Forest Memorial Gardens. 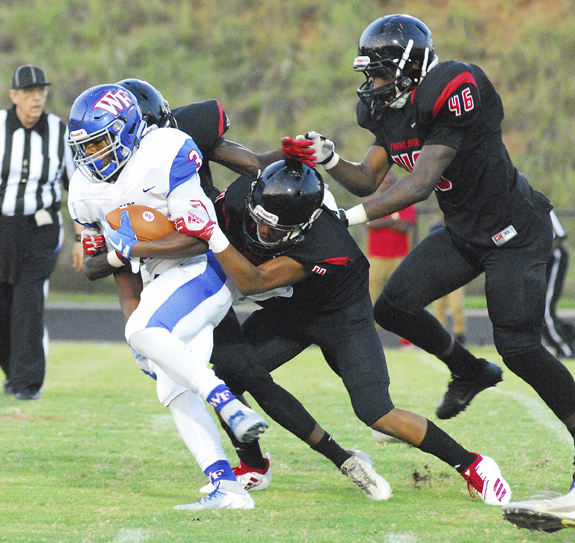 FRANKLINTON -- Maybe even more than a victory, Franklinton was seeking overall program respectability during its home football contest Friday against powerhouse Wake Forest. Certainly, FHS went into the matchup as a prohibitive underdog, which was understandable considering the fact that the Cougars are the two-time defending state champions -- and hadn't lost in the regular season since 2013. BUNN -- Having a three-week layoff isn't a preferred option during the high school football season -- but it seemed to work for the Bunn Wildcats. Bunn, thanks to an off week and a postponement due to poor weather, hadn't been in action since Aug. 30 against Southern Nash. But the Wildcats were effective from the get-go Friday during their Northern Carolina Conference opener on the road against Oxford Webb. CREEDMOOR -- South Granville is considered one of the teams to beat this fall in the Northern Carolina Conference football standings -- and for good reason. The Vikings are the defending league champions, and are off to a strong start this year with an undefeated record heading into Friday's NCC event at home against the Louisburg Warriors.